Voucher entitles the bearer to 50% off main meals when ordering from the main menu. 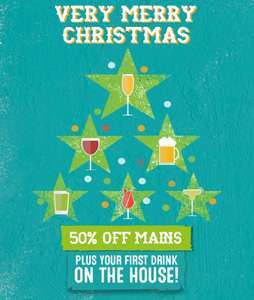 Offer excludes The Ultimate Fajita, cannot be used in conjunction with any other voucher, offer, promotion, except for the First Drink On Us Voucher. Offer excludes breakfast, set menus: Christmas, lunch, fixed price menu or kids. One voucher per transaction. Valid at all Chiquito restaurants. To redeem discount, show your server the voucher, valid every day, all day until 11th December 2017. Offer entitles the guest to one selected drink included with the purchase of one main per person when ordering from the main menu. Main meal excludes meals from Christmas menus, breakfast, set menus including lunch, fixed price menu or kids. Guests can select one drink to choose from 125ml Glass of House Prosecco, 175ml House White or Red Wine, any Soft Drink or any of the following Draught Beers: Brahma, Becks Vier or San Miguel. Offer may be used in conjunction with other promotions or offers. Offer is valid every day, all day, up to and including 11th December 2017 at all Chiquito restaurants. Offer available when dinning in only. Offer is available to over 18’s only. Do you download the app? Seems like a good deal if they honour it - last time I tried to use a voucher in Chiquito they disputed it and I ended up having to pay. Not been back since. Seems like a good deal if they honour it - last time I tried to use a …Seems like a good deal if they honour it - last time I tried to use a voucher in Chiquito they disputed it and I ended up having to pay. Not been back since. Doing it for the drink! The last time I went here, I ordered a Caesar Salad with sauce on the side. I was given a plate of iceberg lettuce, no chicken, no cheese. I complained and eventually the brought over a rubbery piece of over cooked chicken. It was dreadful. What's worse is they were fully prepared to charge me £10 for a plate of lettuce. Ugh! Both honored without question. Great service. Good atmosphere. Very nice food - very big portions. I went with a family member, two main meals and 2 shandys cost £16 all in with these vouchers. I.e £8 each. Can't argue with that.